Road and railroad subbases are very sensitive to impacts during construction. Precipitation, drenching and construction traffic, and their combined effects, can cause severe damage. As we know, the subbase is subjected to the greatest load during construction and these loads are not distributed but linear loads, as the construction equipment move on the surface. Therefore the subbase must be designed to consider these impacts and must be reinforced to ensure the underlying subgrade does not suffer any rutting, for slack waters in the rut may cause the quick failure of the substructure of the whole road structure. Most suited for subbase reinforcing are biaxial or triaxial geogrids with integral junctions. Obviously the type of fill on the grid is important too. 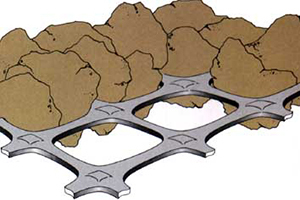 These types of geogrids do not function properly with well graded 0/60 crushed stone. It is important that the so called interlocking effect between the grid and the fill particles is created, i.e. the particles protrude into the openings of the grid and are locked in place. Based on the bearing capacity of the subgrade, using design charts, the thickness of subbase course can be determined that will provide the required load bearing capacity on the top of the subgrade. In the construction of roads and railroads an important objective is to ensure access to the construction site in all weather conditions. This objective is also met by subbase reinforcement. 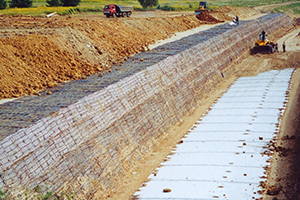 Embankment foundations act on relatively better quality subgrades as subbase reinforcement, because the objective is to increase the bearing capacity of the structure from poor to the generally required value of 40 MPa. Subbase reinforcement can not be discussed without the drainage of the soil structure. 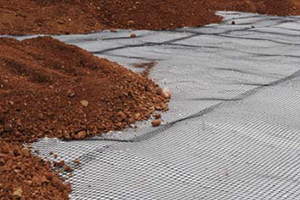 New geosynthetic products are gaining ground that can replace drainage blankets and can be connected into vertical drains made of the same or similar materials. With their joint use the drainage of earthworks in cuts or embankments can be properly solved. They ensure both during construction and service that the earthwork will not get drenched through, ensuring that the bearing capacity realised at the construction will be kept up in the long run. 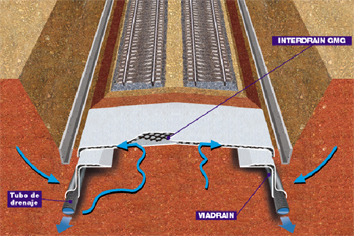 Subbase reinforcement has a special case when railway ballast is reinforced. Tensar developed a grid type for use in railway ballast reinforcement that doubles the service life of the structure. It is a good idea to use it for new structures because with low extra cost longer service life can be achieved. In Hungary this solution has good potentials in the rehabilitation of railway sections with speed restrictions (slow zones). Speed restrictions cause considerable losses of energy and time and it would be practical to rehabilitate these sections to allow constant speed over the whole length of the line. This can be realised with this geogrid reinforcement and the investment will pay off in a couple of months.